A starter air wedge designed to replace the use of a wedge on vehicles with soft metal b-pillars. Our Air Jack� air wedges are the industry standard and best-selling available. A popular, Larger variant of air wedge. Our Air Jack� air wedges are the industry standard and best-selling available. The Super One Hand Jack variant is larger and provides more spreading force than the standard size pry-bar. Insert your wedge with ease using Strip Savers. A dual air wedge designed for stubborn, stiff door frames. 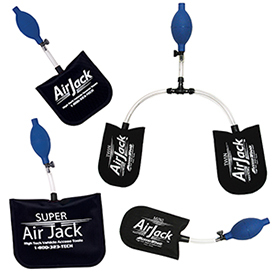 Our Air Jack� air wedges are the industry standard and best-selling available. A wedge designed specially for opening trucks or any larger vehicle. Designed for in-the-door tools, this Wedge with its integrated Strip Savers will make tool insertion easy into any door panel, bypassing all weather-stripping preventing damage to the vehicle. An assortment of different wedges, including the Wedgee Wedge and Truck Wedge, giving you many choices for your in-the-door tool openings. Not recommended for use on long reach openings. Designed to help protect the weather stripping when inserting a wedge into a door jam, the Wonder Shield is a must-have for anyone performing long reach style openings. 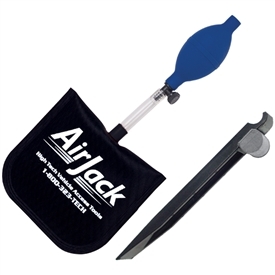 Purchasing all 4 Air Jack air wedges together saves money and ensures you always the right tool for the job.